Dragonwood may be played by 2, 3, or 4 adventurers. These adventurers are tasked with slaying all sorts of hideous beasts that seek to threaten the land. These creatures are contained in the green Dragonwood deck. The greatest of these foes are the blue and the orange dragons, the final bosses of the adventurer’s journey. These cards are shuffled into the bottom half of the Dragonwood deck. Prior to this happening, a number of cards must be removed from the Dragonwood deck. For 2 players, this number is 12 cards. For 3 players, this number is 10 cards. For 4 players, this number is 8 cards. 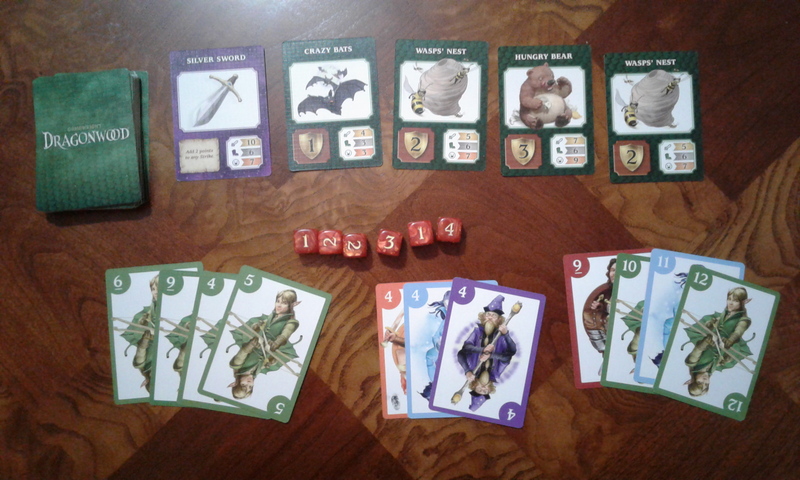 At the beginning of the adventurers’ quest, the top five cards of the Dragonwood deck are drawn and placed face-up in a row in the middle of the table. There are three types of Dragonwood cards: creatures, enhancements, and events. The effects of events occur immediately when drawn. Whatever the event card says must be executed in that moment of play. If an event card is discovered in the original five card reveal, remove it and shuffle it back into the Dragonwood deck and reveal a new card. Enhancements can be used to make the adventurer’s quest easier. And creatures are fodder for the fortune and glory of the adventurers. The adventurer deck is then shuffled. Five cards from it are dealt to each player. The adventurer deck contains numbered cards 1-12 in five suits along with four joker cards with a Lucky Ladybug on them. When a Lucky Ladybug is drawn, the player discards the Lucky Ladybug and draws two more cards. A player may have no more than 9 adventurer cards in their hand. If they exceed this number, they must immediately discard to bring their total hand size back down to 9. 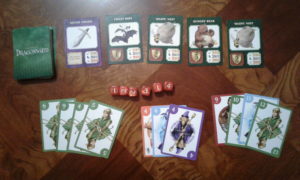 The adventurer cards are played and creatures are thereby slain and taken as trophies in three ways. The player may strike the creature by playing a straight of numbered cards of any color. An example might be red-9, green-10, blue-11, and green-12. The player may stomp a creature by playing cards of the same number. An example might be purple-4, blue-4, and orange-4. Or the player may scream at a creature by playing cards all of the same color. An example might be cards that are all green. Each Dragonwood card revealed on the table has a strike, stomp, and scream value. In order to defeat the Hungry Bear I could stomp on him by playing three cards with the number 4 on them. The Hungry Bear’s stomp value is 6, which is the number I have to roll in order to slay the bear and take him as a victory trophy. I receive one die for each card I play in an effort to slay the creature; in this case I would receive three dice. The dice are six-sided and have the following numbers on their faces: 1, 2, 2, 3, 3, and 4. This means with a roll of three dice, it is only slightly probable to get a 12, but impossible to roll an 18. There are six such dice which is the maximum number of cards that may be played at a time. The minimum number of cards a player may play is one. If my roll to slay the Hungry Bear is 6 or above, then I take the Hungry Bear and add him to my personal victory pile and I place the cards I used to attempt to slay him to the adventurer deck’s discard pile. If my roll were less than a 6, then I must discard one card from my hand representing a “wound” from the encounter with the creature. The adventurer card discarded may be from any adventurer card in my possession, not just the cards currently in play. Enchancements are captured in the same way as creatures, but other enhancements cannot be used to aid in capturing new enhancements. In an adventurer’s turn, the player has two options: draw a card, or attempt to slay a creature or capture an enhancement. The player with the most victory points from slain creatures at the end of the game wins. The game ends when either both the orange and blue dragons have been slain, or the adventurer’s deck has been fully played through then reshuffled and played through a second time. 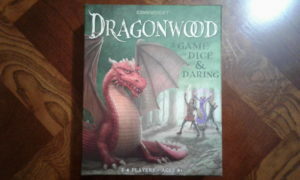 Dragonwood deck in play, adventurer card combinations, and dice. After the rules had been laid down, the adventurers set out on their quest to slay the wild beasts of the land, to ultimately defeat the vicious dragons threatening the safety of their peoples. Laid before us were items of mystical powers and creatures of varying strengths. A Magical Unicorn was charmed by one of my fellow adventurers to give her plus one in subduing any beast. Another fellow adventurer laid claim to a Silver Sword to give her plus two to her strikes against any creature. But me, I chose the way of the sailor, the Bucket of Spinach proved my greatest weapon dealing an extra two stomp damage to any fowl beast. Along the way we all had our successes and failures, incrementally increasing our victory points, until at last it happened; the blue and orange dragons were revealed. They were the most majestic of creatures: powerful, colorful, graceful in their movements, and deadly. We targeted the blue dragon first, given that it was slightly weaker than the orange dragon. A few of my fellow adventurers tried their luck with the blue dragon, but all wound up wounded from their attempts. As fortune would have it, I had succeeded in obtaining a one time use enchantment, a Lightning Bolt, that would increase my chances against the dragon by 4 damage points. With the help of my trusty Bucket of Spinach, I stomped that blue dragon into the dirt to the cheers of all the people of the land. Unfortunately for them, the adventurer deck ran out shortly thereafter for the second time. My fellow adventurers and I counted up our victory points, looked at each other, and commended ourselves for the trophies we were able to seize. We’ll let the common folk contend with the Orange Dragon now that we have become rich in our fame and fortune.